Dutch Apple Pancake – Modernized! 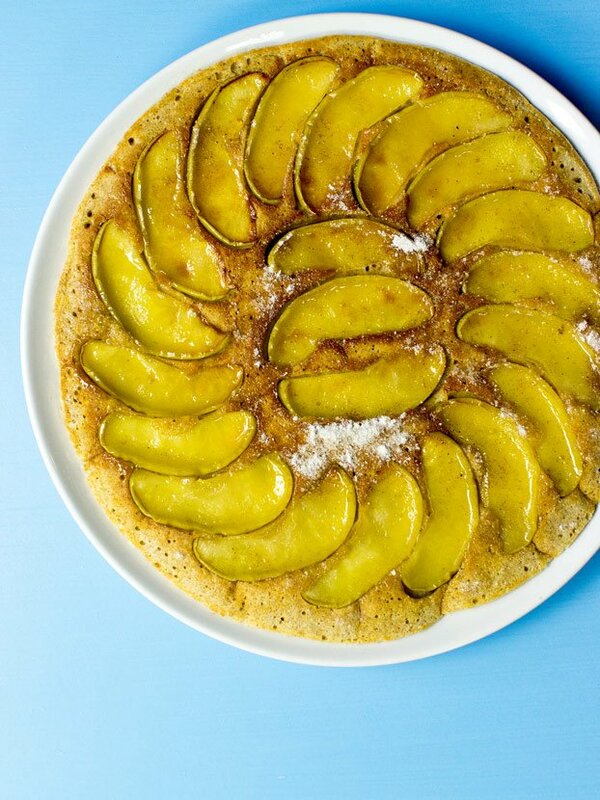 Everybody has an opinion about pancakes, this Dutch apple pancake included. Some want them flat and thin like a crêpe, some want them big and fluffy like a cake. Some sweet, some savoury. There’s almost no pleasing everyone. That’s why we enlisted Jansen, friend and chef extraordinaire. He’s also Dutch, which is pretty critical when it comes to making a Dutch apple pancake. 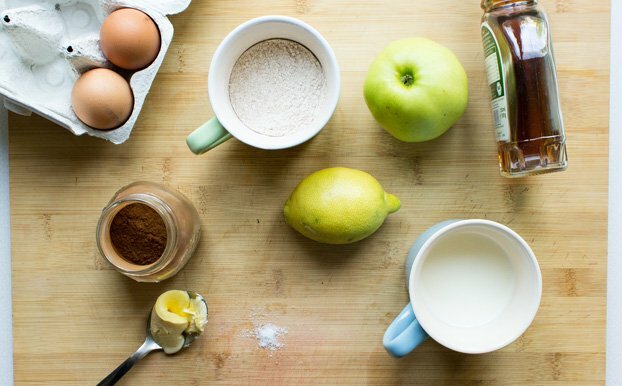 Dutch apple pancakes have a long and proud history, and there’s a good reason for this: they’re delicious. 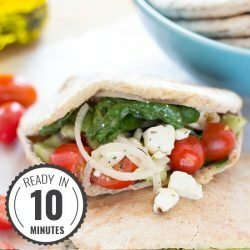 They’re also easy to make, and are great to eat at anytime. We’ve had them for breakfast, brunch and lunch, as well as dessert in the evening. 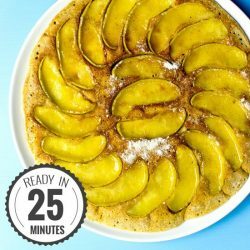 In fact Dutch apple pancakes really excel as dessert – not only are they little hassle, but they’re quick and great for impressing whoever it is you want to impress. Dutch Apple Pancake – Flat or Fluffy? 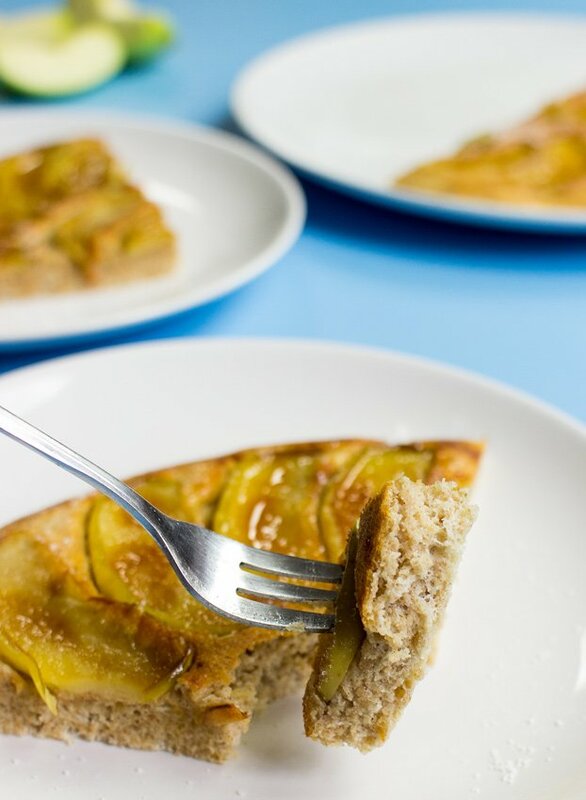 Jansen came forward to us with two possible methods for creating this Dutch apple pancake – both with their own merits. The first is the super-simple, yet mightily impressive ‘standard’ version. This method is one the we usually make when cooking for ourselves. If we have guests round and want to pull out all the stops, we whip out version two. It takes three minutes longer, but the result is a big, light and fluffy pancake that really looks the part. It’s possibly even more delicious too, high praise indeed. The difference is purely whether you separate the eggs and beat the white separately before folding it into the rest of the mix – if you don’t have the time or don’t feel comfortable doing it, then don’t! Method one is already a winner. Even if you’re not cooking this yummy dessert up for a hot date, there are other people this pancake appeals to – kids! I’ve found through personal experience that anything remotely linked to the word ‘pancake’ will get snaffled up immediately – and that’s not a bad thing. 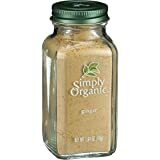 The only added sugar in these is through the maple syrup – and that’s only two tbsp for the whole batch. The rest is made sweet and delicious through the caramelised apple. It also contains eggs, a great source of protein for the little ones (well, everyone really!). The protein contained is also considered a ‘complete’ protein – unlike almost all plant products, which we generally have to mix together to get our intake of all essential amino acids. They’re also excellent sources of B12, something vegetarians would always be sensible to keep an eye on. The icing on the proverbial pancake, so to speak, is the presentation. Originally Dutch apple pancakes were sliced in their pans, but unless you’re using an iron-cast skillet you’re likely to scratch your pan by doing that. Instead, after removing from the oven, lay a large plate over the pan, hold tight, turn both upside down, and let the pancake plop onto the plate. Perfect. Just don’t forget oven gloves. Lesson learnt. 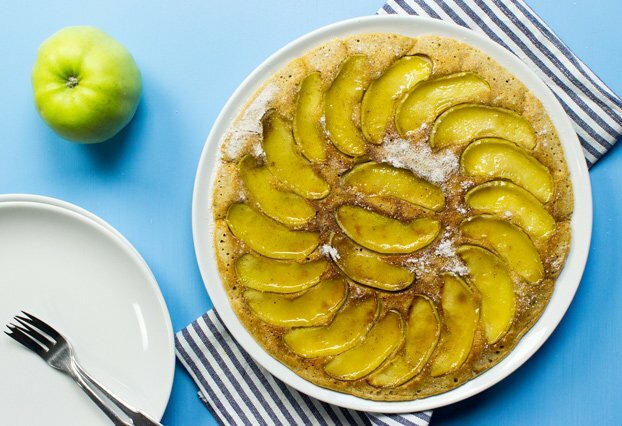 Dutch Apple Pancakes - Modernized! This modernized version brings the classic dish up to date with quick preparation and easy ingredients, while keeping the same well-loved taste. Cut the apple into thin slices. It's up to you if you want to take the skin off the apple. 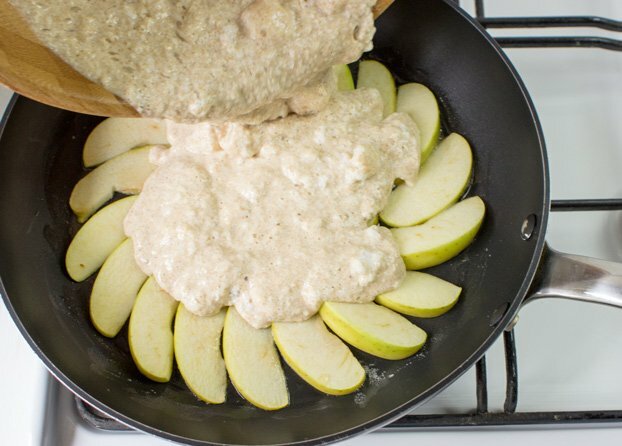 Heat up a non-stick pan to medium heat, add the butter, half of the maple syrup and place the apple slices nicely in the pan. Let it all caramelize for 5 minutes. Use the time to make the dough. Add the eggs, together with rest of the maple syrup, milk, cinnamon, salt, lemon juice and lemon zest and stir in the flour. Make sure you don’t have any lumps. We recommend using a hand blender for this. Optional: add in the ginger powder. Pour the mix into the pan. Let it cook for another 2 minutes, then place the pan in the oven for 12 minutes. Make sure your pan is oven-proof! Take out this lovely Dutch Apple Pancake and enjoy! For perfect presentation, after removing from the oven, lay a large plate over the pan, turn both upside down, and let the pancake plop onto the plate. 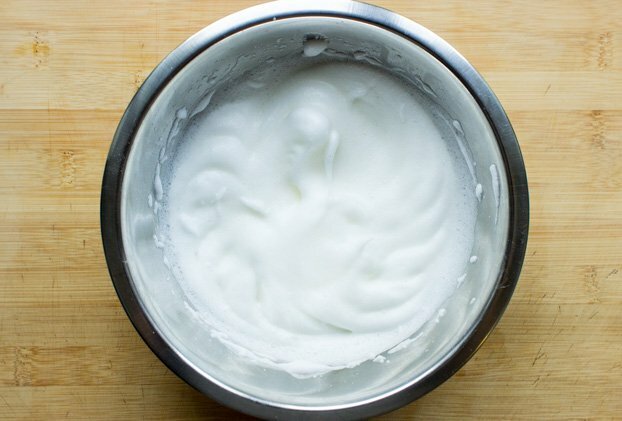 As an extra step when making the batter you can separate the eggs, beat the egg whites until stiff and gently fold it into the mix. Don’t throw out the egg yolk, that goes into the batter with the rest of the mix. 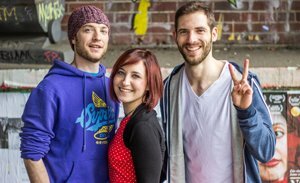 IF YOU LIKED THIS RECIPE: Then you absolutely need to check out our Kaiserschmarrn recipe. It’s another extremely tasty pancake that would work perfectly well as a dessert or treat. Or give these Banana Egg Pancakes a shot. They’re super simple to make, yet mega tasty and only require two ingredients. We’ll let you guess which. 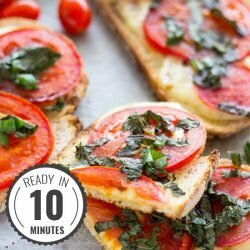 Any ideas on how to make this recipe gluten free? It looks so yummy, I would love to try it. Hi Courtney! Although I haven’t tested it yet, I love the idea of coconut or almond flour instead of wheat in this recipe. I feel like either would fit the flavour really well. Would that work for you? I made this for breakfast and served it with bratwursts and fresh spinach, drizzled with a little extra maple syrup- it was a big hit! Probably my own fault for not following the recipe to the letter, but I didn’t have whole wheat flour in so used plain, and the batter came out a little too dense. I think I would try this with plain flour again adding baking powder or using self raising flour (just for convenience as I always have those and the other ingredients in the house). My Dutch apple pancake looked fantastic and was nicely sweet and spiced without being overwhelming- I’m always happy to find new breakfast recipes that aren’t too stodgy -and this one will be a keeper! 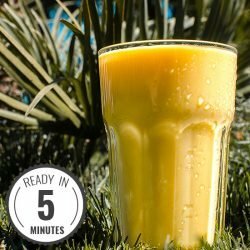 Loved this – and it makes plenty for 2 breakfasts! (or more). Having it cold tomorrow with some Greek yogurt – I can’t wait for breakfast time! I didn’t fancy putting my crepe pan in the oven so caramelised the apples and did the first bit of cooking in a 7″ square cake pan (8″ round is about the same) placed on a hot griddle plate. Worked well and turned straight out onto the plate.